Here are the ten most popular news articles, week ending 5th June 2016, covering catastrophe bonds, ILS, reinsurance capital and related risk transfer topics. To ensure you never miss a thing subscribe to the weekly Artemis email newsletter updates. Europe was hit by severe weather, with thunderstorms, hail and floods affecting many countries. German insurance industry association the GDV said it expects insurers will face at least $510m (EUR450m) of losses due to storm Elvira. Pascal Demurger, director general of French mutual insurers group the MAIF, said the French floods and storms could cost insurers over EUR2 billion. Pricing at the key June 1st reinsurance renewal season is expected to decline by an average of 3% to 5%, according to data gathered by Morgan Stanley analysts from Bermudian reinsurance firms, and rates may now reach a floor it is believed. Tropical Storm Risk (TSR), one of the leading forecasters of Atlantic seasonal hurricane activity, has updated its prediction for the 2016 Atlantic Hurricane Season, saying it now expects an above average level of activity. Meanwhile, NOAA has forecast a near normal season in 2016. The Property Claim Services (PCS) business unit of Verisk Analytics has issued a preliminary estimate of insurance industry losses from the recent Fort McMurray, Alberta Canada wildfires, putting a figure of C$4.6 billion to the event, which is approximately US$3.52 billion. Solvency II will benefit the reinsurance market through an increase in demand, which is already being seen in longevity risk transfer and also benefit the domiciles or markets which have sought Solvency II equivalence, particularly in commoditised reinsurance lines, according to Fitch Ratings. 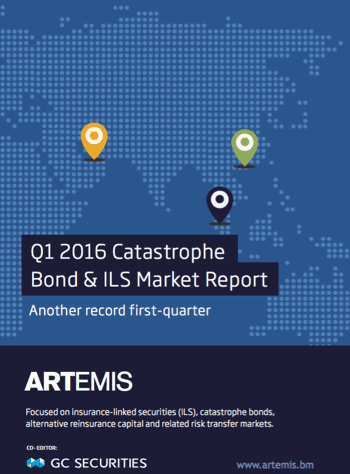 One of the world’s largest insurance companies is returning to the catastrophe bond market for the first time since 2013, as a $150m Blue Halo Re Ltd. (Series 2016-1) cat bond is launched to benefit sponsoring Allianz Risk Transfer, a unit of the Allianz global insurance group. One of the largest Japanese domestic insurers, Sompo Japan Nipponkoa Insurance, is planning to offer travel or tourism companies and other potentially affected industries a parametric insurance product that pays out on a heightened threat of volcanic eruption. The growth of the ILS market in recent times has seen the needs and demands of investors in the space change, which has driven a need for risk modellers to respond to the evolution of the marketplace, according to Ben Brookes, Vice President of Capital Markets at RMS.